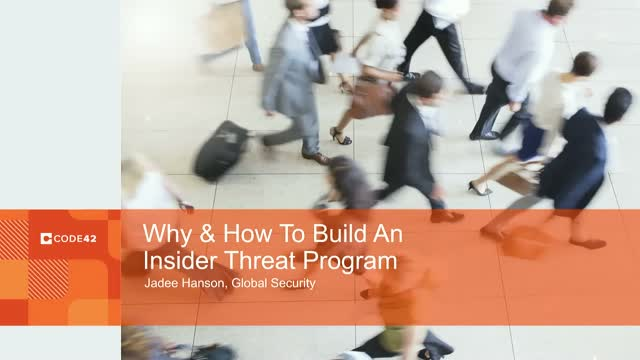 Jadee Hanson, Director of Security at Code42, provides a behind-the-scenes look at what it's really like to run an insider threat program -- a program in which you can take steps to prevent employees from leaking, exfiltrating, and exposing company information. This webinar will provide cloud security professionals with insider threat examples (and why you should care), recommendations for how to get buy-in from key stakeholders, and lessons learned from someone who has experienced it firsthand. Jadee Hanson, CISSP, CISA, is a security professional with more than 13 years of experience. Jadee’s passion for security was born out of a computer science internship and developed into a profession with her first role at Deloitte. After 5 years and a lot of travel, Jadee’s consulting experience led her to Target Corp. where she spent 8 years on its security team, building many of the security programs and functions that exist today. Currently, Jadee is the Director of Security at Code42. In addition to her day job, Jadee is also the founder and CEO of a nonprofit, Building Without Borders.